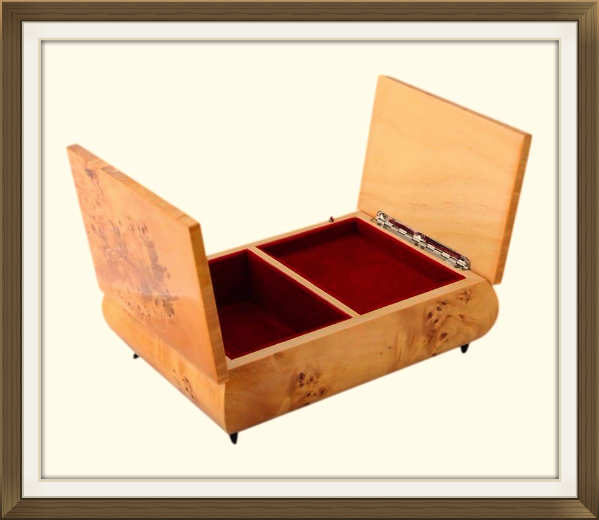 This is a wonderful vintage Italian musical jewellery box, playing the beautiful tune of 'Love Story'. It dates to the 1970s and was made in Sorrento. This box has a beautiful burl Maple veneer and very pretty floral inlay to the lid. 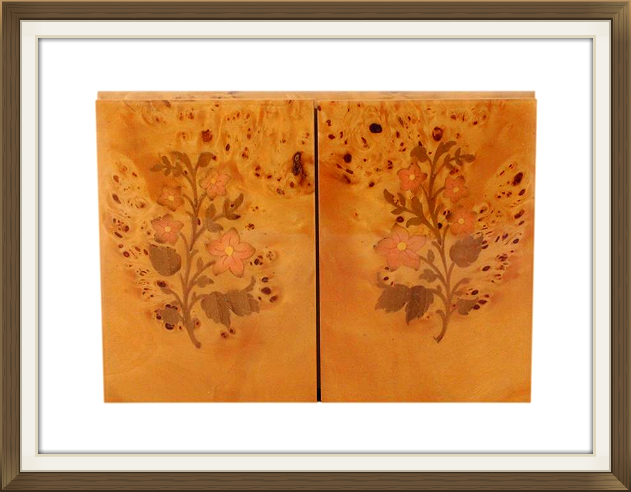 The veneer has been beautifully polished and varnished, and has a smooth and glossy finish. 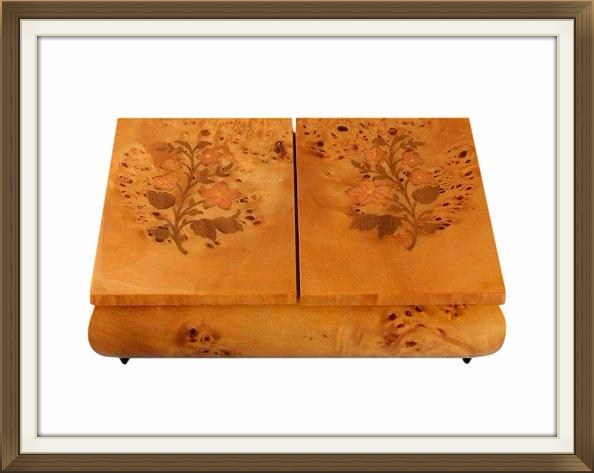 The inlay consists of two varieties of wood. 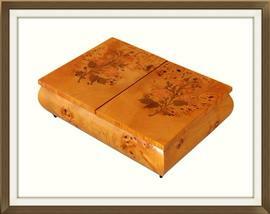 The box has a more unusual, two lidded opening, and beautiful curvature to the sides. It is complete with its original piano 'stop' hinges, which prevent the lids from falling right back. 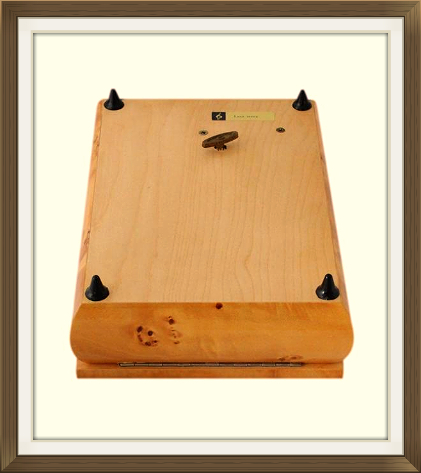 The box stands raised on its original tapered feet, and the bottom of the box has retained its original song title label. The interior has a single storage compartment to the left, and the musical movement is cased to the right. Both are nicely separated by a solid wood partition. There is shallow storage space upon the ledge of the movements casing. All of the interior has a beautiful brushed red velour lining. 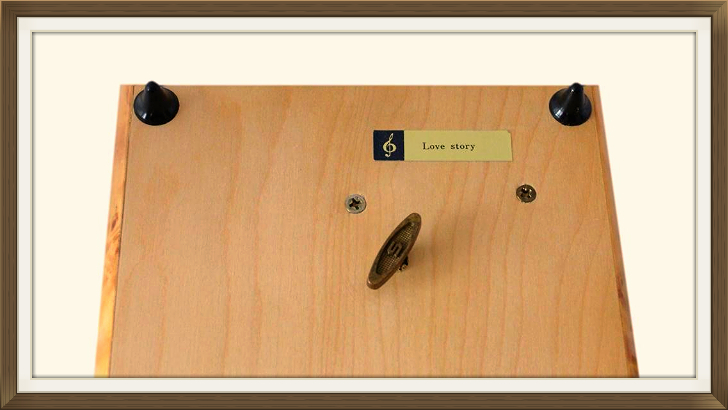 The movement plays the beautiful tune 'Love Story', from the 1970 romantic drama film of the same name. It is in perfect working order. The musical movement is operated via the winding key on the bottom of the box. 7 turns of the key are sufficient to wind up the movement. The music stops as it should, when the lid is closed, or when the movement is fully unwound. This wonderful box is in excellent condition with very little wear! All of the inlay is present and intact, and the box is structurally sound. There are no cracks or nasty scratches. The interior linings are very good with no splits or fraying. They have a few little marks which are barely noticeable. The hinges are in perfect working order, as is the musical movement. 11.5 by 8.5cm with a 4.0cm depth. 11.5 by 8.3cm with a 2.0cm depth.